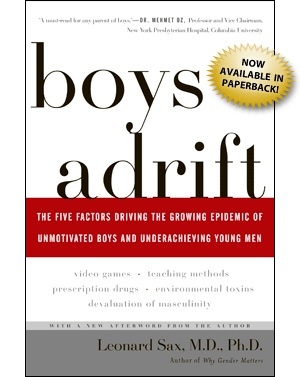 I am been re-reading a book I covered last fall, Boys Adrift, by Dr. Leonard Sax M.D..Ph.D. Sax is a family physician, and research psychologist who has also written about gender differences in education. Since I often work with families struggling with parenting children who are facing challenges in school or have a label of ADHD, some of his ideas always give me food for thought . Sax posits that five factors are contributing to the decline in boys and young men achieving and staying motivated. ~Video games, in particular violent games, and the effect they have on brain development. ~Teaching methods in schools. He discusses among other ideas the “feminization” of education. ~Prescription drug use in children to manage ADHD. He writes about the increase in the diagnosis of ADHD and the exploding number of prescriptions for powerful stimulant drugs to manage this diagnosis. ~Endocrine distruptors in the environment leading to later maturation in boys and earlier maturation in girls. ~Devaluation of masculinity in society and a lack of positive male role models in mainstream culture. 1. Taking an interest in and containing your own emotions will naturally lead to more effective communication with one another. 2. Let go of the personal conflict and focus on what is best for your child or children. 3. Recognize the importance of finishing what was started when you had your children, even though you’re no longer together. 4. Stay focused on child and parenting issues, avoiding personal issues such as who’s dating who and who said what about whom. 5. Focus on the “business of parenting” rising above pettiness and the need to be right. Remember that reducing conflict between parents greatly reduces your child’s anxiety and that over time a child will fare much better. 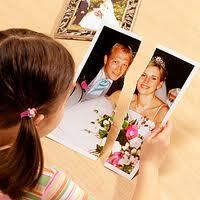 That is the best gift you can give your family post separation and divorce.